Eric Thomas Post was born November 21, 1976 in Houston, Texas to Thomas G. Post and Karen Sue Backen. He was a graduate of Sam Houston State University with a Bachelor of Science Degree in Agriculture-Agriculture Business. Eric passed away July 15, 2018 in a Houston hospital at the age of forty-one. His surviving family members include father, Thomas Post of North Carolina; mother, Karen Backen of Madisonville; daughter, Ella Grace Post of Magnolia; brother, Matt Post of Madisonville and nephew, Matthew Post of Madisonville. He is also survived by many cousins, aunts and friends. Funeral services have been scheduled for 2 P.M., Sunday, July 22, 2018 at the Midway Church of Christ in Midway, Texas. Joel Douget will officiate the service. A private interment for immediate family, only, will be in the Rocky Ridge Cemetery. A public visitation will take place Saturday, July 21st from 5 P.M. to 7 P.M. at the Madisonville Funeral Home in Madisonville. 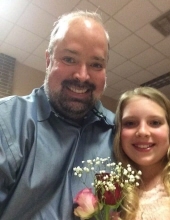 In lieu of flowers, memorial donations may be made to the Midway Church of Christ Missionary Fund. Arrangements are under the direction of Madisonville Funeral Home. To send flowers or a remembrance gift to the family of Eric Thomas Post, please visit our Tribute Store. "Email Address" would like to share the life celebration of Eric Thomas Post. Click on the "link" to go to share a favorite memory or leave a condolence message for the family.